"The hills just kept coming!" Second race in Kentucky ever and first Run the Bluegrass. I know people who love this race, so I figured I’d come run it. I knew there would probably be hills, but you really have no clue until you come and run the course itself. The Expo: Thursday afternoon and 11-830 on Friday with race day bib pick up as well. Plenty of vendors and local stuff to see, which was great. Pick up was at Keeneland Race Course, which is right by the airport. Bib numbers are emailed week of, or you can look them up race day. Shirts/jackets (if you upgrade) are towards the end. Plenty of parking available as well. 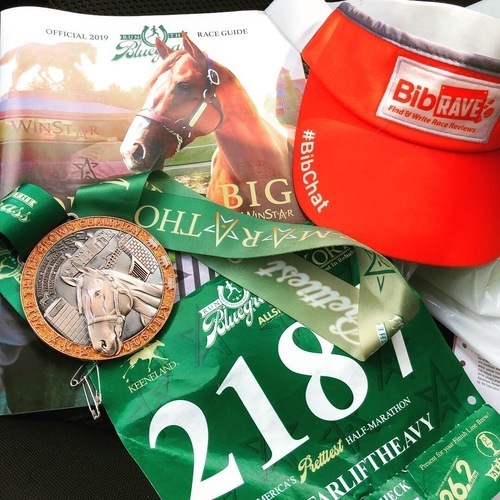 Race Distances: half marathon, 7 miler and the Yearling (3.65 miles). Time: the Yearling starts at 8:50 AM, the half and 7 miler at 9 am sharp. Race day parking: plan to be there at least 45 min to an hour early just to park. Parking is at Keeneland and you enter through gates 1 and 2. Gate 1 was pretty backed up and I ended up going through gate 2, which took a whole lot less time. The course: very scenic, be ready for hills. Did I mention hills? The course starts in Keeneland and takes you through the property before heading out onto the roads of Lexington. Be ready for not a whole lot of spectator support, but that’s ok. While on course, plenty of horse farms, distilleries. Weather wise, overcast and 50s/60s with some rain about half way into the race (though nothing heavy). Aid stations on course, though I couldn’t figure out the spacing between them. Aid stations had water and something called SWORD, which I’ve never heard of. Swag: best swag I’ve seen in awhile medal wise. The medal had Justify on it and it’s 3D like. You have the option of the standard shirt or upgrading to a jacket, which I ended up doing. Overall fun race, still unsure if I want to put myself through those hills again though! "Because two races are better than 1!" Did back to back races this year in Portland for my first Shamrock PDX race. I did the 5K first Sunday morning and then went right into the 15K. The Expo/Packet Pick up: fairly painless process. I walked to the Oregon Convention center, but also fairly easy to Uber/Lyft there as well. Some construction on the interior, but plenty of vendors and things to do in the expo itself. Have your QR code that they email you (or from Active.com) ready as they assign your bibs there as you check in and they scan your code. Also be aware if you want to switch distances, do it leading up to race week or at the expo! Plenty of vendors, free food, free goodies, etc. The course: Be ready for some hills the first 5 miles. The race takes you along SW Naito Parkway and to SW Barbur Blvd and it's pretty much all uphill the first 5 miles or so. Holy Hills Portland! From SW Barbur, you head into George Himes Park and get some good views of the city from up above once you hit the highest point of the run before you head down hill and along some of the winding road ways of Portland. On your way back, be prepared to see the half marathoners coming up the hills you're already done with, though their a few miles further along due to them adding some miles before joining up with you. The last few miles of the race are downhill, so overall your quads, hamstrings and hip flexors are put the ringer. Pretty good set up of aid stations with electrolytes and water on course. What to improve on: I was actually signed up for the half marathon, but it didn't start until 9:20 (25 min after the 15K). I was set to run the half up until about 740 AM race morning and ended up not being able to get a late check out at the hotel (partly my fault for not checking on check in) and I wouldn't have had enough time, especially with the hills, to finish and get back to the hotel, shower and check out without being charged. For us out of towners, I think an earlier half marathon time would be better, especially since we have more distance to cover. Results: posted on their website fairly quickly and in real time. If you switch distances, do it prior to race morning. Since I dropped down last minute, I had to get my race time adjusted to reflect the 15K finish rather than a DNF half time (all it took was a simple email and it was fixed pretty quickly). Overall a fun race, good atmosphere, but be ready for some hills! Hopefully something can be worked out so the half can be started earlier in the future! First time doing the Shamrock Portland Race and I had a blast! I ended up registering for 2 races due to how spread out they were and the 5K was the first of the morning. The expo: at the Oregon Convention Center with pick up Friday and Saturday. Easy to get to (I walked from my hotel), but can't speak from a parking stand point. Bit of a walk around some interior construction this year, but plenty of space once you were in the expo. Bib pick up was painless, just remember to have your QR code pulled up, as they scan it and assign your bib based off your distance there at the expo. Shirt pick up just as easy. I would bring your own bag though, there weren't bags passed out. Plenty of vendors and races to visit and if you're looking to buy stuff, keep in mind no sales tax in Oregon! The course: the 5k is out and back for the most part, though you due a bit of an outpouch by turning onto Taylor, then SW 2nd, followed by W Salmon before getting back on SW Naito Parkway Drive. A little bit of a hill, but nothing compared to what the 15K and half marathon deal with. 1 water stop that I saw on course, miles were marked and it's a fairly quick race! Post Race: be ready to join in a morning long party. Plenty of food trucks, music, post race refreshments, beer garden, soup, etc. Medals for the 5K this year as well, that was new this year. Overall, a fun race and an easy way to get the entire family involved if you didn't want to get in on the longer distances. "Inaugural Napa Valley Half Marathon"
I ran the half marathon this year for the NVM, and it was the first year that a half marathon has been associated with this race (this year was the 41st running of the full marathon). I got in the Thursday night before the race to explore Napa before the race and enjoy some wine beforehand. Travel: options include flying into San Francisco or Sacramento. I’d do Sacramento in order to avoid the hassle of SFO. I rented a car and drove in and it was about the same amount of time from Sacramento airport as it was from SFO. Expo/Packet Pick Up: Happens the Saturday before the race. This year, pick up was at the Marriott Spa and Suites in Napa. Pre race shake out run before the expo for anyone interested and then the expo is open from 9 am to 6 pm, with bib pick up extended from 6-8 pm with no expo. I think there was also an option for having your bib mailed to you. If you got the VIP upgrade, after you picked up your bib, there was a hospitality room on the first room with some extra goodies (Nuun water bottle, a bottle of wine, treats, etc). I’m bummed that I had literally no room in my suitcase to take my wine home with me. The expo had presentations/demos and speakers through out the day, which was pretty nice to have. Small expo, but I think it was pretty local, which is always good to see. Pasta Dinner: $45, essentially all you can eat with pasta, salad and desserts. I heard some people with issues that there was only 1 gluten free pasta. My biggest thing was there was really no protein involved. I would have loved to see some chicken or meatballs or fish, something to balance out the carbs. Speakers as well, but they didn’t start until 6 (dinner started at 5:30). I had to find the pasta ticket station. Maybe a better idea, especially if you pre purchased tickets up until a certain point, would be to staple them or include them with your bib so it’s one less stop to make. Pre Race Transportation: the half and the full started at different places along the Silverado trail. The Half started at 7 AM and the full at 730 AM, which I think threw some people for a loop, as the half marathon buses left at 510 (ish) AM and the full at 5:40 (ish) AM. I heard of at least a few people missing the half marathon busses. I stayed next to the Marriott and took the shuttles out first thing in the morning. The course itself: essentially all downhill, which for California is a win/win situation. A little bit of a hill close to the start of the half marathon, but nothing to get too bent out of shape over. The half started about 1/4 a mile from the Conn Creek Winery and the first 10 miles or so went along the Silverado trail. We passed at least 7-10 wineries that I could see, all different set ups and in different stages of getting prepped for their season it seemed. Mile 10-11 takes you past Oak Knoll before having you turn once more and head towards Vintage HS, where the finish was at. Very scenic course with intermittent people cheering, but it was kind of nice to not have spectators from start to finish. Post Race: seemed like a lot of HS students were volunteering and having fun with it, which was cool. Water at the finish with some bananas and nutrigrain type bars. Soup was being served in the cafeteria, PT was also available. There was an area to check your results as well. Overall, however, a great race. One of the few in California that’s all downhill and doesn’t throw hills at you at every turn. If you’re in need of a good long weekend and fun race, take a look at this, especially with the addition of the half marathon! "Hearbreaker Half marathon: Not lying about the hills"
On the fence about this race. Went to PDX for the weekend to get out of the Spokane Snow and to keep my endurance up over the winter and found the Heartbreaker Half in Hillsboro. Bib Pick up: Though the race is in Hillsboro, packet pick up was at a Portland running store closer to PDX airport. Email said pick up wasn’t available race day, so I made the treck to get my bib. Easy enough as they scanned your QR code from your registration email and assigned you a bib there. Other area races were also there. Showed up race morning to packet pick up being offered. What the what? The course: be prepared for rolling hills. Did not realize how many hills there were. It’s also never good when you’re at the start and the announcer comments that the course was changed and there are more hills than last year. Would have been beneficial to have an elevation map on the website. Course was a loop for the half marathon and met up with the 10K on two separate occasions, so you had to pay attention to splits. There were some water stops, but not nearly enough, I don’t think. The first one I saw was at least 4 miles in. The other issue I had was it was on active road with no real area marked off for runners. I don’t want to be snapped at by volunteers, when there’s no marked area for me to run inside. Though the leaders may not have seen much traffic, more than a few cars didn’t slow down on course for us. Post race: not a whole lot in terms of post race food. I couldn’t even identify some of the things they had left over.